Background: Oral lichen planus (OLP) is an inflammatory disease, and its etiology remains unknown, but there is much evidence that implies the existence of an immunological background. Aims: The salivary levels of tumor necrosis factor alpha (TNF-α) and interleukin 6 (IL-6) as representatives of T-helper 1, 2 cells in OLP are compared to healthy individuals. Methods: This case-control study contains 60 patients with OLP and 30 healthy individuals. Patients were selected from those referred to the Department of Oral Medicine of Ahvaz Dentistry. After explaining the study whole saliva was collected. The salivary levels of TNF-α and IL-6 were measured using ELISA test. Statistical Analysis: t-test and Kruskal-Wallis test were used for statistical analysis. Results: The salivary levels of TNF-α and IL-6 in the group with OLP were significantly higher than the healthy group. The average concentrations of TNF-α and IL-6 were in the erosive/atrophic group (0.23 ± 0.08, 0.46 ± 0.02 Pg/ml respectively). The salivary levels of TNF-α and IL-6 in the erosive/atrophic group were significantly higher than the healthy and the reticular groups. Conclusions: The salivary levels of TNF-α and IL-6 were significantly increased in the group with OLP. Oral lichen planus (OLP) is a chronic inflammatory disease that affects 1.27% of the population and is more common in women (1.57) than men (0.96). Different forms, such as white striations, white plaques, erythema, ulcers, and blisters can be seen in the clinical features of OLP. The studies generally divided OLP into two groups (reticular, erosive/atrophic) to be better evaluated. OLP is a T-cell-dependent autoimmune disease in which TCD8 cells begin to kill epithelial cells, but the cause is unknown. T-helper cells can be divided into two subgroups of Th1 and Th2 cells, which produce the cytokines interferon-gamma, interleukin-2 (IL-2), tumor necrosis factor alpha (TNF-α), and the cytokines IL-13, IL-10, IL-5, IL-4, respectively. TNF-α is a central mediator of acute inflammation and anti-tumor immunity. The overproduction and uncontrolled function of TNF-α may lead to pathological conditions such as malnutrition and septic shock. Increased local production of the cytokine in the blood flow can lead to negative changes in the immune response., The mediator seems to play role in regulating and signaling of the immune system. As a pro-inflammatory cytokine, IL-6 seems to be highly produced in the OLP lesions. Its effect on the development of OLP can cause the growth and differentiation of T-cell apoptosis in keratinocytes in the basal layer of epithelial proliferation, which eventually leads to hyperplasia. Considering that TNF-α plays an important role in the pathogenesis of autoimmune diseases, and IL-6, which plays a role in the inflammation, may also be involved in disease pathogenesis. Analysis of saliva components was used for the evaluation of biomarkers. Saliva has advantages compared to blood, such as ease of access and evaluation, consisting of a large volume of electrolytes and the biomarkers, and preventing stress and pain in patients. Forasmuch as, there is no general agreement on the role of the two cytokines in OLP, the concentration and the role of salivary TNF-α and IL-6 in patients with OLP are examined in this study. In this case-control study, 60 patients with OLP, who referred to the Ahvaz Jundishapur University of Medical Sciences, Faculty of Dentistry, were selected for this study; and also, thirty healthy volunteers who matched with the case group for age and gender were selected as the control group. The case subjects have been confirmed as lichen planus cases in the clinical feature and histological diagnosis. All patients studied should not have a history of smoking and severe systemic diseases, including chronic hepatitis and diabetes, and have also received no treatment for OLP within 3 months later from the date of start study. Pregnant and lactating women were also excluded from the study. Prior to sampling, patients with OLP were placed in two groups of reticular and erosive/atrophic lesions. To avoid antioxidant changes, samples were collected between the hours of 8-10 am. After the research, project was explained and the written consent form was obtained, samples of whole unstimulated saliva (WUS) were collected using a standard procedure. In short, people should not eat food 1 h before sampling; and during sampling, the patients should take a swallow and spit WUS in a sterile vial for 5 min. The collected saliva then centrifuged for 20 min with a rotation of 3500 g; and the supernatant liquid was removed and used for analysis. The Ethics Committee of the University approved this study according to the 59th WMA General Assembly, Seoul, Korea, October 2008. IL-6 and TNF-α levels in WUS were measured by ELISA kit (eBioscience, San Diego, CA, USA). The t-test was used for comparison of the OLP group with the control group, and the Kruskal-Wallis test was used for the statistical analysis of OLP subgroups and the control group. P < 0.05 was considered as statistically significant. This study, 60 patients were enrolled as the case group who was diagnosed with OLP: 50% with reticular lesions, and 50% with erosive/atrophic lesions. Demographic data of the study groups are summarized in [Table 1]. The average IL-6 and TNF-α levels in the saliva of OLP groups were higher than the control group, whose statistical analysis of the t-test showed a statistically significant difference (P = 0.018, P = 0.02 respectively) [Table 2]. 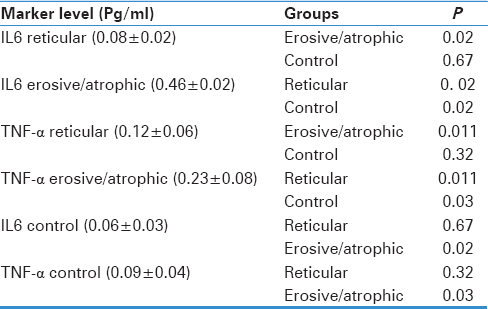 According to of [Table 3], the IL-6 and TNF-α levels in the saliva of the erosive/atrophic subgroups were higher than the reticular subgroups; and statistical analysis showed a significant difference (P = 0. 02, P = 0.011 respectively). Level of IL-6 and TNF-α in the saliva of erosive/atrophic group were higher than those of the control group, statistical analysis which showed a significant difference (P = 0.02, P = 0.03 respectively). The level of IL-6 and TNF-α in the saliva of reticular group were higher than those of the control group, statistical analysis which did not show a significant difference (P = 0.67, P = 0.32, respectively). OLP is a keratotic inflammatory disease of the oral mucosa that can affect all parts of the oral cavity, including buccal mucosa, tongue, and gums. The aim of this study was an evaluation of the IL-6 and TNF-α levels in OLP lesions, which reached the conclusion by comparing the values obtained from the study group with the control group that both factors IL-6 and TNF-α in the study group were significantly higher than the control group. Although the etiology of this disease is not clear, it is widely accepted that immunological mechanisms are involved in the pathogenesis of the disease. Although many possible causes have been proposed to explain the pathogenesis of OLP, the exact cause remains uncertain. The results of Zhange et al. study on IL-6 and TNF-α in China, showed a positive correlation between these factors and clinical type of OLP, which is consistent with the results obtained in our study. In addition, the study of Ghallab et al. showed that TNF-α in the saliva of patients with an erosive clinical type of OLP has increased substantially compared to the control group. This finding is consistent with our results, and there was a significant increase in the levels of this factor. Kalogerakou et al. study reported a decrease in type 1 and 2 of T-cells production, which is inconsistent with our results. One reason for this difference might be the peripheral blood samples that were used in the study, whereas we used saliva samples in our study. The samples of lichen planus examined in both studies were limited to the mouth, and thus, the cells may be locally active. Therefore, it may be better tissue or saliva samples that locally secreted to evaluate. In the study of Pezelj-Ribaric et al., it has been emphasized that saliva sample is the best option to examine pro-inflammatory cytokines; and like our study, increased levels of TNF-α were observed in this study. TNF-α plays a carcinogenic role, and erosive/atrophic forms have a higher incidence of malignancy compared to reticular types. Thus, our study also showed that higher levels of TNF-α in the erosive/atrophic forms, which can confirm this. Like this study, an increase in the two cytokines was found in the study of Juretic et al. about the IL-6 and TNF-α levels, which was conducted on premalignant lesions such as lichen planus. In the study by Liu et al. on the IL-6 and TNF levels in diabetic patients with lichen planus, it was found that the levels of both cytokines in patients with lichen planus were significantly lower than those in the control group, which is inconsistent with our results. The level of cytokines based on genetic polymorphisms in individuals with different races has different levels of secretion. In addition, the secretion level of IL-6 varies depending on the extent of inflammation in different areas. Considering that, the races studied are different; also, there is no criterion for making inflammation the same between the two studies, in addition, in this study, diabetic patients eliminated from the study because diabetic patients had lower immune system than healthy patients and this factor may act as a confiding factor. This can cause the inconsistency between the two studies. As there are inconsistencies in different studies, for better and more accurate evaluation of the pathogenesis of lichen planus, it is suggested to examine and compare tissue and saliva samples. The salivary IL-6 and TNF-α levels that were considered as representatives of T helper 1, 2 cells have increased in OLP groups (particularly in erosive/atrophic type) in comparison with the control group; which focuses on the role of T-cells. This study confirms the effect of immune cytokine in pathogenesis of OLP and shows the salivary levels of TNF-α and IL-6 were significantly increased in the group with OLP. All authors thanks to laboratory Immunology, Oral Medicine and Periodontology and implant department. This research funded by research deputy of Ahvaz Jundishapur University of Medical Science. This budget was spent to purchase materials exclusively. This deputy did not any effect in results. Carrozzo M. How common is oral lichen planus? Evid Based Dent 2008;9:112-3. Shekar CH, Ganesan S. Oral lichen planus. J Dent Sci Res Rev 2011;2:62-87. Liu W, Dan H, Wang Z, Jiang L, Zhou Y, Zhao M, et al. IFN-gamma and IL-4 in saliva of patients with oral lichen planus: A study in an ethnic Chinese population. Inflammation 2009;32:176-81. Sugermann PB, Savage NW, Seymour GJ, Walsh LJ. Is there a role for tumor necrosis factor-alpha (TNF-alpha) in oral lichen planus? J Oral Pathol Med 1996;25:219-24. Lantz M, Björnberg F, Olsson I, Richter J. Adherence of neutrophils induces release of soluble tumor necrosis factor receptor forms. J Immunol 1994;152:1362-9. McFarlane CG, Reynolds JJ, Meikle MC. The release of interleukin-1 beta, tumor necrosis factor-alpha and interferon-gamma by cultured peripheral blood mononuclear cells from patients with periodontitis. J Periodontal Res 1990;25:207-14. Parameswaran N, Patial S. Tumor necrosis factor-α signaling in macrophages. Crit Rev Eukaryot Gene Expr 2010;20:87-103. Hirano T, Akira S, Taga T, Kishimoto T. Biological and clinical aspects of interleukin 6. Immunol Today 1990;11:443-9. Bartold PM, Haynes DR. Interleukin-6 production by human gingival fibroblasts. J Periodontal Res 1991;26:339-45.
al-Humidan A, Ralston SH, Hughes DE, Chapman K, Aarden L, Russell RG, et al. Interleukin-6 does not stimulate bone resorption in neonatal mouse calvariae. J Bone Miner Res 1991;6:3-8. Norioka K, Hara M, Harigai M, Kitani A, Hirose T, Suzuki K, et al. Production of B cell stimulatory factor-2/interleukin-6 activity by human endothelial cells. Biochem Biophys Res Commun 1988;153:1045-50. Wilson M, Reddi K, Henderson B. Cytokine-inducing components of periodontopathogenic bacteria. J Periodontal Res 1996;31:393-407. Revel M. Host defense against infections and inflammations: Role of the multifunctional IL-6/IFN-beta 2 cytokine. Experientia 1989;45:549-57. Fujihashi K, Kono Y, Beagley KW, Yamamoto M, McGhee JR, Mestecky J, et al. Cytokines and periodontal disease: Immunopathological role of interleukins for B cell responses in chronic inflamed gingival tissues. J Periodontol 1993;64 5 Suppl: 400-6. Gu GM, Martin MD, Darveau RP, Truelove E, Epstein J. Oral and serum IL-6 levels in oral lichen planus patients. Oral Surg Oral Med Oral Pathol Oral Radiol Endod 2004;98:673-8. Santoro A, Majorana A, Bardellini E, Festa S, Sapelli P, Facchetti F. NF-kappaB expression in oral and cutaneous lichen planus. J Pathol 2003;201:466-72. Miller CS, Foley JD, Bailey AL, Campell CL, Humphries RL, Christodoulides N, et al. Current developments in salivary diagnostics. Biomark Med 2010;4:171-89. Malamud D. Saliva as a diagnostic fluid. BMJ 1992;305:207-8. Aghahosseini F, Arbabi-Kalati F, Fashtami LA, Djavid GE, Fateh M, Beitollahi JM. Methylene blue-mediated photodynamic therapy: A possible alternative treatment for oral lichen planus. Lasers Surg Med 2006;38:33-8. Scully C, Carrozzo M. Oral mucosal disease: Lichen planus. Br J Oral Maxillofac Surg 2008;46:15-21. Carrozzo M, Uboldi de Capei M, Dametto E, Fasano ME, Arduino P, Broccoletti R, et al. Tumor necrosis factor-alpha and interferon-gamma polymorphisms contribute to susceptibility to oral lichen planus. J Invest Dermatol 2004;122:87-94. Rhodus NL, Cheng B, Myers S, Bowles W, Ho V, Ondrey F. A comparison of the pro-inflammatory, NF-kappaB-dependent cytokines: TNF-alpha, IL-1-alpha, IL-6, and IL-8 in different oral fluids from oral lichen planus patients. Clin Immunol 2005;114:278-83. Zhang Y, Lin M, Zhang S, Wang Z, Jiang L, Shen J, et al. NF-kappaB-dependent cytokines in saliva and serum from patients with oral lichen planus: A study in an ethnic Chinese population. Cytokine 2008;41:144-9. Ghallab NA, el-Wakeel N, Shaker OG. Levels of salivary IFN-gamma, TNF-alfa, and TNF receptor-2 as prognostic markers in (erosive) oral lichen planus. Mediators Inflamm 2010;2010:847632. Kalogerakou F, Albanidou-Farmaki E, Markopoulos AK, Antoniades DZ. Detection of T cells secreting type 1 and type 2 cytokines in the peripheral blood of patients with oral lichen planus. Hippokratia 2008;12:230-5. Pezelj-Ribaric S, Prso IB, Abram M, Glazar I, Brumini G, Simunovic-Soskic M. Salivary levels of tumor necrosis factor-alpha in oral lichen planus. Mediators Inflamm 2004;13:131-3. Juretic M, Cerovic R, Belušic-Gobic M, Brekalo Pršo I, Kqiku L, Špalj S, et al. Salivary levels of TNF-α and IL-6 in patients with oral premalignant and malignant lesions. Folia Biol (Praha) 2013;59:99-102. Bidwell J, Keen L, Gallagher G, Kimberly R, Huizinga T, McDermott MF, et al. Cytokine gene polymorphism in human disease: On-line databases. Genes Immun 1999;1:3-19. Xing Z, Gauldie J, Cox G, Baumann H, Jordana M, Lei XF, et al. IL-6 is an antiinflammatory cytokine required for controlling local or systemic acute inflammatory responses. J Clin Invest 1998;101:311-20.